Start saving the planet in your own town. Protect your local communities’ environment from climate change and expand who gets to use it! Apply Today! Apps are due May 1, 2019. 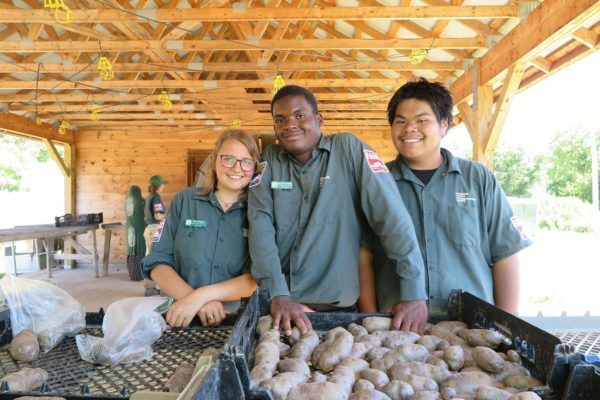 We are looking for young people ages 15-18 years old to work in their own communities on our Conservation Community Crews in Burlington, South Burlington, Williston, and Woodstock. Get paid to work outside for 4 or 8 weeks between June and August. Questions? Email Hans for Conservation or Kyle for Farm. Our Conservation Community Crews come together as a team to enhance local natural areas in your own community by day and return home at night (no camping needed!). This might include building trails and bridges in local parks, building rain gardens in town, and removing invasive species. We are offering two summer sessions this year. What does the work day/week look like on a Community Crew? Can you pick me up at home? What are typical projects a Community Crew works on? Who are the project partners VYCC works with? What does education on a crew look like? We are offering two sessions this year. Note session dates for Community Crews and Spike Crews differ slightly. Burlington Community Crew will be offered both sessions. South Burlington Community Crew will be offered 2nd session only. Williston Community Crew will be offered 1st session only. Woodstock Community Crew will be offered both sessions. You may work any of the sessions offered. If you have any conflicts within the session, please let us know and we will see what we can do! Community Crew Members are Vermont residents between 15 and 18 years old and often need to be from the community the crew is working in. Check this year’s crews below for more information about the crew working in your area. Community Crew Leaders are over the age of 20 and do not need to be from the community in which they work, although it’s awesome when they are! How big are crews? Who else is on the crew? Community Crew Members are typically from the community in which the crew is working and are between 15-18 years old. Crew Leaders are not necessarily from the community the crew is working in and are over the age of 20 and have leadership experience. Conservation Community Crew Members get paid every 2 weeks, earn $10.78/hour, and work approximately 40 hours per week. There is a small amount ($10) deducted from paychecks for group snacks. Community Crews work Monday – Friday, 7:45 a.m. until 4:30 p.m. The Crew will gather at 7:45 a.m. at a central location (determined by the Crew Leader) in your community. The crew will then drive to the worksite, work for the day, and head home at 4:30 p.m.
*VYCC uses WoRD books ( aka”Writing, Reading, and Discussion”) to spark deeper thinking, conversation, and reflection based on articles and stories a crew reads together during a break from the work day. Topics range from learning about food systems, to social issues, to methods of personal growth. You must have reliable transportation to and from the designated meeting location on work days. The meeting place will be chosen by VYCC staff and the Community Crew Leaders based on the work/project site. Any personal gear, you’ll need to bring with you. This includes your water bottle, boots, sturdy clothing, raingear, backpack, etc. We provide all the tools, equipment and transportation to the worksite your crew needs to complete the project you’re working on. Community Crews work with local organizations and agencies to complete projects in local parks and trail systems. Crews may build trail or maintain trails, plant trees, remove invasive species, improve waterways, and maybe compete some carpentry projects. Who can be on the crew? This crew is for Burlington Youth ages 15-18. This crew will run for two sessions this summer. Crew Members can work one or both summer sessions. Community Crew Members get paid every 2 weeks, earn $10.78/hour, and work approximately 40 hours per week. There is a small amount ($10) deducted from paychecks for group snacks. This is a crew specifically designed and tailored for Burlington youth! In partnership with Burlington Parks, Recreation & Waterfront, this crew will work on city parks, garden spaces, and trails! Want to work on the Burlington Community Crew this season? Apply now! This crew is for South Burlington Youth ages 15-18. This crew will be during will run for Second Sessions ONLY! This crew, for South Burlington Youth, will work with the recreation department and other partners to improve South Burlington parks and trails! Want to work on the South Burlington Community Crew this season? Apply now! This crew is for Williston and surrounding area youth ages 15-18. This crew will be during will run for First Session ONLY! This crew, for Williston and surrounding area Youth, will work with the recreation department and other partners to improve Willistons parks and trails! Want to work on the Williston Community Crew this season? Apply now! This crew is for Woodstock area youth ages 15-18. This crew will be during will run for both first and second session. Crew Members can work one or both sessions! 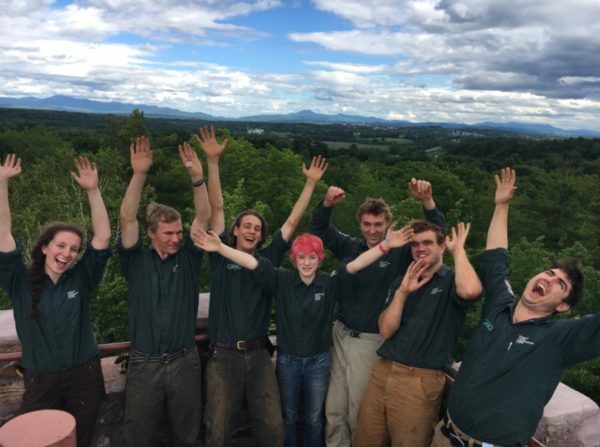 This crew, for Woodstock and Windsor County youth, will work in Vermont’s only National Park, Marsh-Billings-Rockefeller National Historical Park, to improve the park’s accessibility and trails! Want to work on the Woodstock Community Crew? Apply now!